Opening night of a tour by any artist is usually not the best concert to attend because by nature, especially after a few months off the road, because by default it ends up being warmup night with few surprises. 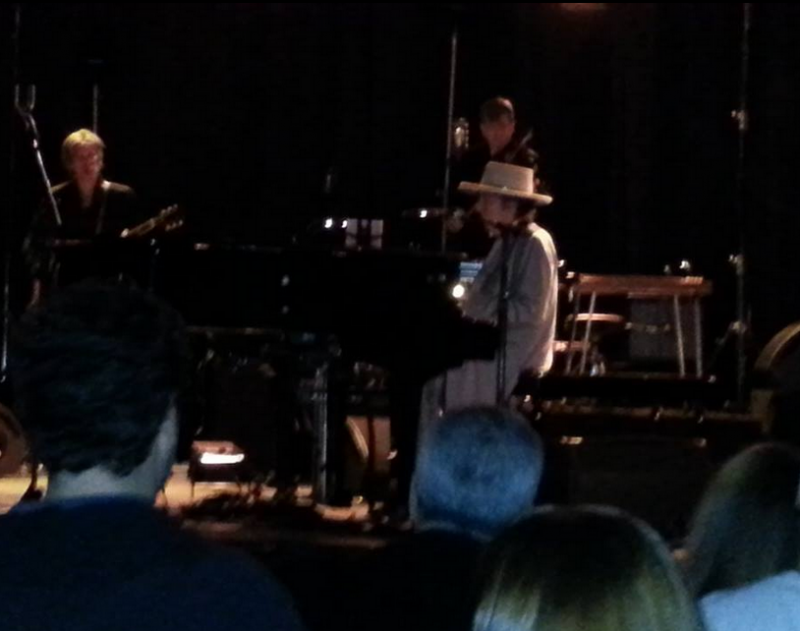 Dylan was in excellent voice, singing sort of softly the way he does on his latest album but effectively. I think by the time this tour hits Memphis if not before, they should be in full gear the way they were in Chicago, Philly and New York last fall. These are not good videos, but the sound is GREAT. You’re welcome. the video is best that it can be, considering the seats. Why state: ‘these are not good videos’? & The audio is great! The sound is great, the visuals are not great. Anyhow, GREAT job – Thanks Alice. Though it is spooky hear him doing the same set over and over again, (what’s his next move??? ), the deepness he reaches is astounding, as if he’s descending into these cherished songs… Just if the crowd wouldn’t yell so hard so that the beauty gets blotted out… Do they really have to shout when finally they recognize Tangled up in Blue, when it is obvious in the brilliantly cristal clear sung first lines? And what is this applauding anytime he blows the harp? God, if only they would listen to this pure music… Why do they want to hear themselves? Applaud after a song is courtesy enough for someone who is not waiting to get lauded and wants to get his music across. Was at the show last night. Same exact set list he played most of last year. Bob and the band both sounded great and the crowd was really into it.